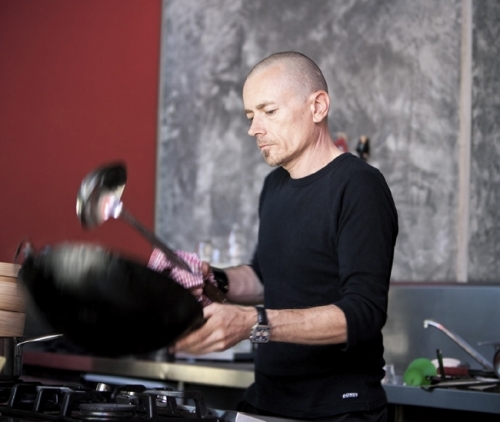 Simon Bryant is a face well known to regional and urban Australia as he and South Australian food icon Maggie Beer are beamed into thousands of lounge rooms and kitchens via the ABC program The Cook & the Chef. The show aired more than 150 episodes over four years, attracting more than 600,000 viewers nationally each week. 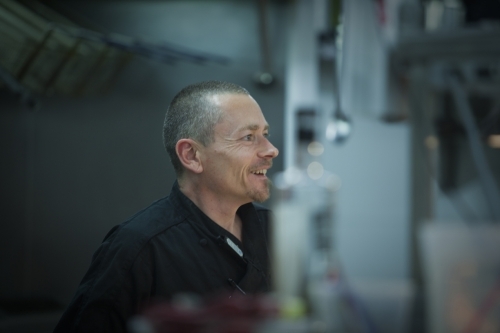 Originally a motor mechanic by trade, Simon returned to study and while working in the university kitchen to earn some extra cash and studying Economics at Melbourne University, Simon realised he’d rather wear a chef’s hat than a business suit. He began his career in several Thai & Indian Restaurants in Melbourne, before moving to Adelaide in 1995. Simon was with Hilton Adelaide for more than 10 years, commencing as a Commis Chef, followed by 18 months as a Chef de Partie in ‘The Grange’ with Cheong Liew and rapidly working his way up to Senior Sous Chef of ‘The Brasserie’. 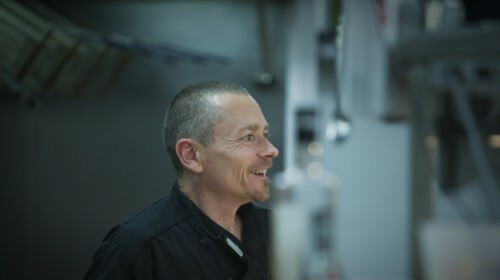 It was in ‘The Brasserie’ where Simon emerged as one of South Australia’s hottest young chefs and was promoted to Executive Chef overseeing 33 staff, 2 of the states leading restaurants, a quick service deli, and as South Australia’s largest hotel, the largest catering and room service operations in the state. Simon is equally proud of his personal achievement in providing ‘real local food’ within the normally restrictive environment of a large scale commercial kitchen by using an ‘in the field’ approach, visiting the state’s producers, forming personal relationships and sourcing the finest product ‘first hand’. Simon passionately believes in using his profile to highlight Ethical Food issues, including the plight of local producers struggling with drought, animals being farmed unethically, using local seasonal food with less environmental impact, the use of Australian native foods and the health and medicinal properties of food. A keen organic gardener at home, Simon also devotes much time and energy into educating Australians of all ages of the benefits of growing and eating their own food and the rewards it brings in terms of health and general wellbeing. This philosophy extends to teaching children about what they are eating, how it grows, how it can be cooked and how what they eat can affect their behaviour and self esteem. A champion of South Australian produce, Simon uses his guest chef, consultancy and speaking engagements in local, interstate and international dinners and events to promote these concepts in an informative and yet relaxed manner that consumers can easily digest. Simon is about to embark on the next stage of his life journey which includes working on his first book, exploring new and innovative television opportunities and developing a ‘virtual restaurant’ for guests to dine in. Simon Bryant was the driving force behind Hilton Adelaide’s Brasserie which showcases local, seasonal produce from South Australia’s gourmet regions. Given a trademark for the term ‘Seriously South Australian®’, winning the 2006 Premiers Food Awards for Services to the Industry, and 2009 SATC tourism award restaurant and catering services demonstrate his commitment to promoting local food. 2007 Hotel Management Magazine Awards for Excellence – Executive Chef of the Year. 2008 Restaurant and Catering Association (SA) – Chef of the Year. Patron for the Adelaide Showground Farmers Market Kids Club. ‘Last Leaf’ column in bi-monthly South Australian gourmet magazine Sumptuous. Showcasing seasonal vegetarian recipes. South Australian Ambassador for Earth Hour 2008 and 2009 – hosting an Earth Hour Gala attended by the Ministers for the Environment and Tourism and inspiring the public with tips for saving energy in the kitchen at home. WOMAD 2008 – Presenter at ‘Taste the World’ showcasing native Australian produce. 2007 Guest recipe designer for the annual Haigh’s chocolates recipe card series. Presenter at Department of Environment and Heritage ‘Reclaim the Food’ Chain event. Ambassador for the Animal Welfare League and official Food Ambassador for Animals Asia, working towards the goal of eradicating the farming of dogs and cats throughout Asia for human consumption as well a supporter of the Moon Bear Rescue program aimed at ending bear bile farming throughout Asia. Campaigned for legislative change enabling Food Donor Laws to be changed – Hilton Adelaide now donates all unsold food to the Hutt Street Centre for the homeless daily. First South Australian business to gain RSPCA Choose Wisely accreditation, using only Free range eggs throughout the Hilton Adelaide. Botanic Gardens Foundation Kitchen Garden Ambassador.